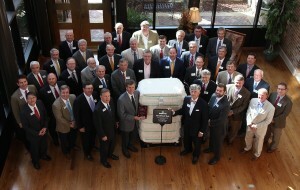 Greenwood, Miss., March 18, 2016/ At their quarterly board meeting in March, the board of directors and officers of Staple Cotton Cooperative Association (Staplcotn) officially recognized the receipt of the 100 millionth bale of cotton received on December 18, 2015 to be marketed by the association. The bale was produced in Donalsonville, Georgia, by Mark Hanna of Hanna Farming Partnership and ginned by Miller County Gin Company. During its first year of business in 1921, Staplcotn members produced 156,264 bales. Five years later, the total number of bales received reached 1 million. In 1956, Staplcotn’s total hit the 10 million mark. “When you look at the fact that we didn’t start receiving 1 million bales or more per year until the 1980s, getting to the 100 million mark this quickly is pretty amazing,” Allen remarked. Hanna was presented a plaque by board chairman, Mike Sturdivant, as a keepsake for his participation in this momentous occasion. Hanna has been a member of Staplcotn since 1995. “It’s quite a thrill to have a part in Staplcotn’s history. I joined Staplcotn as soon as they came to Georgia. I wouldn’t want to be in the cotton business without them. I just don’t have to worry at all about getting my cotton marketed,” he said. Staplcotn is the oldest and one of the largest cotton marketing cooperatives in the United States and provides a range of services to their members, including domestic and export marketing, cotton warehousing, and agricultural financing through Stapldiscount, the lending arm of Staplcotn. Staplcotn is a 100% producer-owned company. They presently handle a total of over 14,000 farm accounts in 11 states – Mississippi, Louisiana, Arkansas, Missouri, Tennessee, Alabama, Florida, Georgia, North Carolina, South Carolina and Virginia. Total membership in the Association, consisting exclusively of growers and share rent landlords, is 8,311 members who are located in 46 states. This membership includes marketing, warehouse and Stapldiscount patrons. Staplcotn’s board of directors and officers officially recognized the receipt of the Associations 100 millionth bale of cotton received on December 18, 2015. The bale was produced in Donalsonville, Georgia, by Mark Hanna of Hanna Farming Partnership, shown above holding his commemorative plaque. Pictured above, 1st row: Russell Robertson; Frederick Barrier; George LaCour; Meredith Allen, President & CEO; Hanna; Mike Sturdivant, Board Chairman; and Shane Stephens. 2nd Row: Mike Moffatt; Tom Dillard; David Camp; Andy Barham; Marty White; Bryan Jones; Coley Bailey; Kent Fountain; Mike Tate; Johnny Laney; Brad Williams; and Jimmy Webb. 3rd Row: Larry Gnemi; Kenny Downs; Tap Parker; Lawrence Long; Walt Corcoran; John Willis; Frank Rodgers; Sonny Davis; Larry McClendon; Stewart Weaver; Mike Newberry; and Jeff Hux. Back Row: Clay Clark; Allen Whitehead; Laudies Brantley; Bowen Flowers; Allen McLaurin; Phil Murray; and Lowry Robinson. Not Pictured: John Newcomb, Kim Rentz, and Hank Reichle.